Delicious food and an ukai cruise makes a memorable night. Take advantage of the convenience of the ukai package plans offered by the ryokans and hotels along the Nagara River. ○Reservations: Contact each hotel or ryokan. 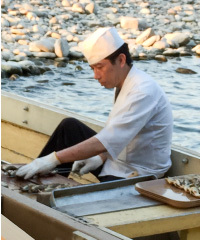 One of the popular features in the ukai package plans is an ayu delivery service on the river. Ayu are broiled with salt on a small boat then delivered directly to passengers on the ukai viewing boats. ※Restaurant tables on the river side require an additional 1,000 yen. ※The hotel dinner can be upgraded with an additional 2,500 yen. ※The hotel staff will guide the guests to the boarding place. ※Onsen (mineral hot spring) bathing is free. The rate is the same as that of the on-board dinner course. ※Check-in is required by 16:00-16:30. ※Waitresses might not be available on-board for certain reasons even in the on-board dinner course. .
※A special rate will be applied for certain periods of time..
※Check-in is required by 16:00. ※Waitresses might not be available on-board for certain reasons even in the on-board dinner course. ※The before-holiday rate will be applied from August 13th through 15th. ※The shuttle service is available to and from the boarding place. ※The Panorama Suite is available with an additional 5,000yen. ※The Stone Spa (women-only) is available for 1,000 yen (tax inclusive) for 60 minutes. ※Dinner can be upgraded with an additional 2,000 yen. ※The hotel dinner can be upgraded with an additional 2,000 yen. ※A special rate will be applied from August 13th through 15th. ※Check-in is required by 17:30.